This looks like an juvenile female frigatebird. Note that this bird has a white head as seen from underneath the bird. Later you will see a picture of an adult female frigatebird that will have a black head. Frigatebirds are huge considering that they only weigh about 3 pounds. This low body weight, combined with the huge wings and a forked tail they use as a rudder allows these seabirds to soar all day, nearly effortlessly, on thermal drafts. Frigate birds look like they float in the air rather than fly. Frigate birds are the acrobats of the feathered world. They seem to effortlessly perform dramatic midair acrobatics such as stops, starts, twists and loops. There is a down side though. While they are superb flyers frigatebirds can't swim or walk. That means if they aren't flying or perched, they're in one heck of a mess. Because frigatebirds do not walk or swim they must either pluck fish and squid from the water's surface or steal it from other seabirds. This adult female magnificent frigatebird is identified by the black body with white belly, gray bill, long forked tail (hard to see the fork in the tail in this picture) with extremely long narrow wings that can span 7-feet in length. They soar on wind currents and do not seem to need to flap their wings. This is identified as being an adult female since the head and throat are black. Juvenile females will generally have a white head when seen from underneath. Look for the picture of the juvenile female with the white head on this page. This is a male frigatebird that is identified by the long forked tail (hard to see the fork in this picture) the narrow wings spanning around 7-feet and solid black with a red pouch. Oh, and they seem to fly/glide without flapping their wings. The magnificent frigatebird is a large black bird. It is about three feet in length and has a wingspan of over seven feet. In the breeding season, males have a bright red throat pouch. This male has a red pouch but it is hard to see from this angle. Females have white throats and bellies. Both have deeply forked, scissor-like tail and sharply pointed wings. These two frigate birds were on a channel marker at the Dry Tortugas. The one on the left with the white head is a juvenile while the one on the right is a mature female. Note the long gray bill with a hooked tip. That is one of the characteristics to look for when trying to identify a frigate bird. It is hard to tell the wingspan on these resting birds but adults can have 7' wing spans. OK, I have got to ask why they are named frigate birds? It seems that they are known for "stealing" food from others. Yes they are recognized as bandits. Their English name comes from the fast fighting ships, called frigates, used by pirates in the 18th and 19th centuries. Now you know why they are called "frigate birds". Since Garden Key and Fort Jefferson are located in the Dry Tortugas 70-miles west of Key West the only way to get here is by boat or sea plane. We opted for the "boat" option and took the Yankee Freedom II ferry from Key West to Fort Jefferson in the Dry Tortugas. The 70-mile ride each way on the Yankee Freedom II is a special treat itself. It takes you past other islands in the Florida Keys chain of islands. However, these islands are not connected to the mainland by bridge. Once you leave Key West Harbor on the Yankee Freedom II you are heading into an area only accessible by boat or sea plane. Thirty miles from Key West the Yankee Freedom II takes you past the Marquesas Keys and thousands of lobster trap buoys and the boats working these lobster traps. 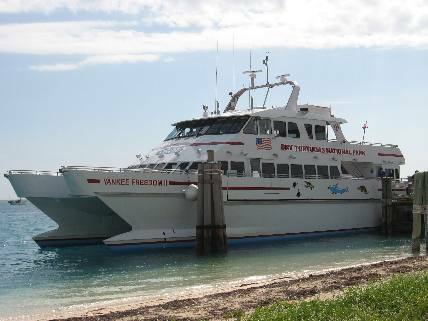 The Yankee Freedom II is the ferry service that transports visitors to Dry Tortugas National Park every day.